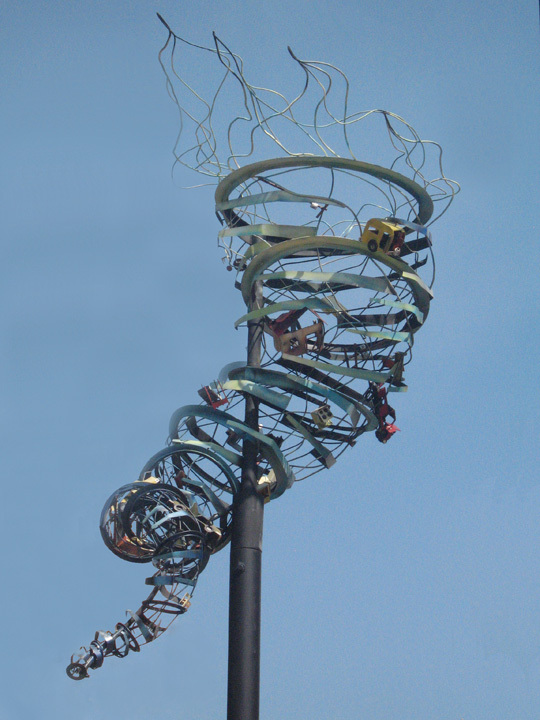 There’s a whirlwind of artistic activity along the Wasatch Back this year: a large metal piece called “Urban Tornado” by Salt Lake City’s Lenka Konopasek has been installed at the Summit County Building in Kimball Junction and Riverton artist Tim Little’s assemblage “Fly Utah” is in front of Coalville City Hall. Both installations are part of a public art program called Summit County Artscape. Started in 2011 to display sculptures on Coalville’s Main Street (resulting since then in the city purchasing three pieces through popular vote), the program changed last year to a leasing concept so artists can be compensated for showing their work. Following an annual call to artists in February, the City Council selects sculptures in April to be leased for a year and placed in the county’s rural communities. The first installation for 2015-16, on display through the end of May and created by Konopasek, is specifically located at the Richins Building, 1885 W. Ute Blvd. in Park City, which houses the DMV and Summit County Public Library. Inspired by the tornado that passed through downtown Salt Lake City in 2005 (and also referencing changes in our national and local environments), the sculpture weighs about 250 pounds and is fabricated with metal rings and bent metal rods. It stands about 8 feet high and is 4 feet in diameter. It depicts furniture, cars and building materials caught in the funnel hovering above the street. 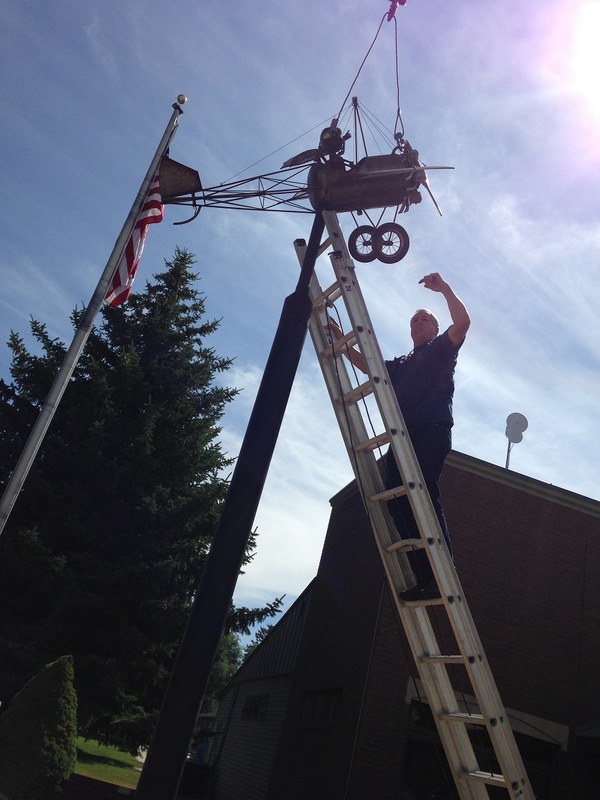 Little’s whimsical work was installed July 6 and represents a crop duster, a meaningful piece in this rural community. It is assembled from a propane tank, sheet metal, wire, bike parts and scrap metal with a wood prop that spins in even a slight breeze. “When I create I use Thomas Edison’s adage, ‘to invent you need a good imagination and a junk pile,’” Little says.